Back in the 1960s, I worked for a little magazine called Guns and Hunting, and one of our regular contributors was a nice old guy from South Dakota named Bert Popowski. Bert was a varmint hunt mostly, and in particular was hell on crows (in those days it was considered fun to pick a roost tree and dynamite it), but he also did a short rifle piece whose title and advice have stuck with me lo these four decades. It was called, “Shoot off the Meat of Your Hand,” and I doubt we could use such a title today because of its unfortunate connotations of self-abuse. What it was actually about was this: Some rifles shoot differently when sighted in off a sandbag than they do when you hold them in your hand. As I’ve learned over the years, not all rifles are sensitive to what they’re resting on, some are sensitive a little bit, and some will shoot way off. It is your job to find out. When you think you’re on target, slide your hand under the fore-end and grasp it in a firm, manly manner. Then shoot three shots and see where they go. Shooting off your hand is not quite as steady as off a sandbag, but there you are. And now a request. For some weeks the Cabela’s in Owatonna, MN has had a left-hand .416 Rigby up for sale. It was made by a gunsmith named Pete Norene who obviously knows his stuff and then some. This rifle is a freakin’ jewel, to put it bluntly. At one point, someone put down some money on it but then lost his nerve. I would appreciate it if one of you southpaws would buy it so I don’t have to keep looking at it and grinding my teeth. The reference number is 999866. If someone will give it a home, I will run a gratuitous photo of Ms. Elisha Cuthbert, or someone equally wonderful. Thank you. Excellent observation. I was taught to shoot like this off a sandbag since I was a kid. Similar results can be seen when using bipods as well. I'm not in the market for a southpaw rifle, but any pictures of Ms. Cuthbert would be appreciated. Well, I'm not a lefty,My income is also below the poverty level so buying this jewel I can not. However your remarks about holding the rifle forearm different ways is spot on . Had an old SS 219 savage,that had been drilled and tapped, wearing an old K2.5 this thing would shoot a 3-6" group at 100 yds. when gripping the forearm. If you just laid the forearm across an open palm(meat of yer hand)the thing would shoot minute of angle with 150 gr. win power points or same weight Federal hi-shoks. often the first two shots would be touching or side by side. Wished I had that ole 30-30 back. I'd rather see a picture of Elizabeth Hasselbeck. She's hotter than Elisha Cuthbert and a Conservative. Pictures of any of these wenches would be fine! I remember Bert Popowski from when I was in high school. Yes, he was a varmint hunter above all else. Sorry, I can't help you with the rifle, Dave. I am right-handed. Do I dare inquire as to the price? I am guessing $8,000. I'd assume the guy who put the downpayment on it had the application for the second mortgage denied? Come on Dave, what are you waiting for? Anyone with an office overlooking Park Avenue should buy two of these rifles and give one away to charity... Boujaily is looking at useless O/U .22 Hornets in the $200,000 range after taxes and you haven't taken the plunge yet? He who hesitates is lost. There's a new Field & Stream blog about fishing and John Merwin is giving away an Abu Garcia 6500 C4 to anyone who has a good reason they need one... only about 20 entry's so far so the odds are incredible. Punch my name to get there since Herr Pretzal won't provide a link. When I first went to look at this gun I thought damn thats a good price, then that extra zero snuck in. If its that doughnut ring that slips over the barrel your talking about the only person I've seen use it is Babe Winkleman on TV. I think its just a gimmick that will go away. I assumed that the doughnut rings were to stabilize harmonic vibrations of the barrel. To mimic most TV hunting shows you need one of them, lots of camo, a huge backpack (still can't figure out what they need to carry because you can usually see a power line, highway, or their Surburban in the background), and a T/C rifle of some kind. Probably has something to do with sponsers. 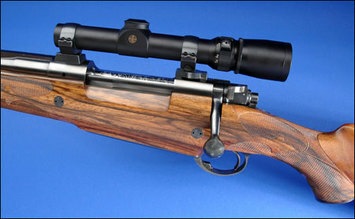 What would any of you say about a guy who bought such a rifle but then got run over by a rhino on safari? I'd say 'can I have the gun'. Dang Dave, I looked up the rifle just to see how much they were asking. The sticker shock made me limp enough I think it is going to take several pictures of Ms. Cuthbert to put me back in working order. Who the hell is Elisha Cuthbert? What would any of you say about a guy who bought such a rifle and and had the rifle run over by a charging rhino? Some rifles are made to look at and others meant to use. No, better keep this beauty in a humidity-controlled gun vault and take your old CZ .416 for the real work. *The gun will do you no good if you get stomped on safari. *The gun will do you no good if you have to take something else hunting. I say we leave Dave's "tooth grinding jewel" in the Cabela's Museum. And Dave, you'll just have to learn to live without a rifle that would do you no good anyway. PS = BlueOx -- "I'd pay money to see that!" You may have seen this one already but it is free! To Dr. Ralph: Your facts are a little shaky. 1. I do not work at 2 Park Ave.
2. When I did work at 2 Park Ave. I had a cubicle with no window. 3. Two Park Avenue is at 32nd St., which is the low-rent district for Park Ave. The bloated plutocrats have their offices between 50th St. and 70th St.
4. In any event the lease for our office is held by World Publishing, not D. Petzal. Glad for this opportuniy to clear things up. No need to thank me. I would buy it just to see some more photos of the lovely Miss Cuthbert. However, since I have noticed a distinct lack of cape buffalo here in the Texas Panhandle, I think it would be a bit much for the prairie dogs. Sorry about your "not even overlooking the Park Avenue slums" office, Dave... I'm guessing Dr. Ralph's Charitable Foundation for Wayward Women won't be receiving that second rifle any time soon? Just in case you change your mind I errrr... the Foundation shoots right handed. Since we didn't get any pictures of Elisha how about one of Terri Harrison? I surrender... do with me what you will!